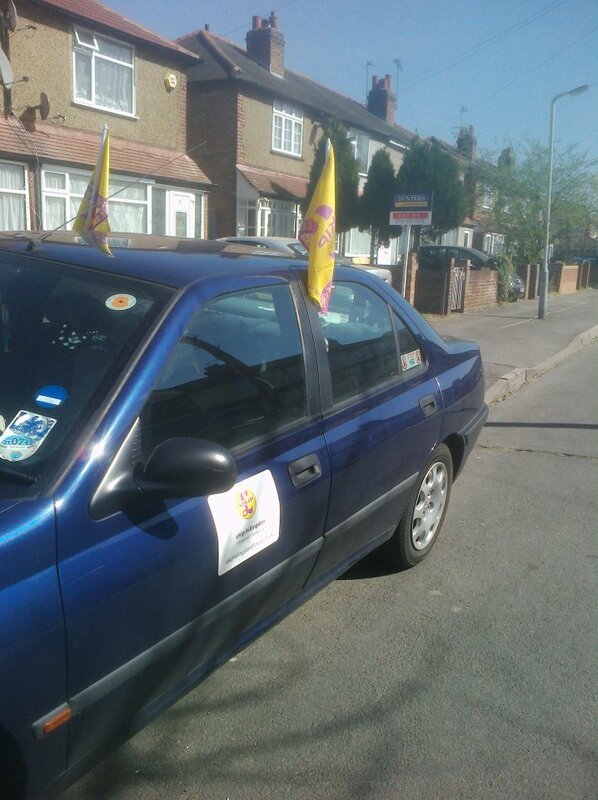 With the party campaigning harder than ever before to pick up council seats, the below post from the UKIP Hillingdon website shows how our local UKIP activists have engaged with the community and are making a positive difference to the area - As one UKIP councillor said to me before, it's about getting the bins emptied, the dog muck off the pavement and the holes in the roads filled! With the increased profile of UKIP nationally, more people are contacting our branch in Hillingdon with issues that are either ignored or they don’t feel comfortable going to their local councillor’s with. A case in point has been the state of the roads in parts of the south of the Borough, which led to our Brunel Ward representative Geoff Courtenay suggesting an action day for yesterday (Saturday 6th April). Geoff has been discussing this with local residents for some time, and leafletted the worst of the roads affected during the week to advise everybody that we would be coming around at the weekend with a petition to the council to resurface Worcester Road and Maygoods Lane (Including Maygoods Green). Splitting in to two groups ,I volunteered to help Jack and we soon got a taste of why local residents are so concerned about this issue as we made our way down Worcester Road. Stopping outside the Cowley St Laurence School, large cracks and potholes were soon apparent – Indeed, as can be seen from the picture below, the road on the zig zag lines outside the school entrance is in a very poor state and could be dangerous to children and adults on the way in. 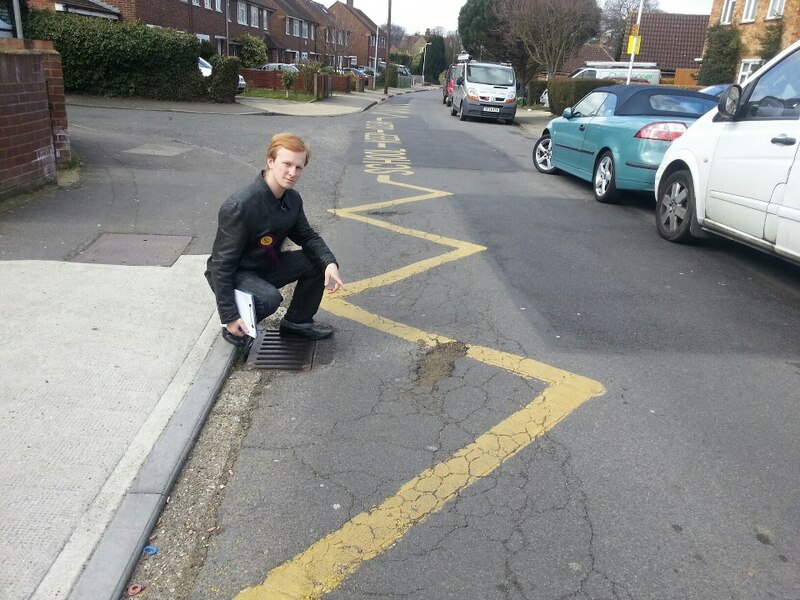 Above – Uxbridge South ward representative Jack Duffin outside Cowley St Laurence School. Later on during canvassing we spoke with a lady whose Autistic son had tripped on one of the potholes and hit his head further up the road at Maygoods Green – She had informed the council, they had sent somebody to put white marks around the hole to mark it for filling yet weeks later the work has still not been done. The target for the petition so that it has to be looked at by the council is twenty signatures – Between Jack and myself we easily surpassed that within an hour and a half, with many answering the doors stating that they had seen the leaflet in the week and had been waiting for us to come around so both themselves and other resident family members could sign. When we met up with Geoff’s team later, they also told a similar tale. The subject of road patching was brought up frequently, with residents advising us that teams would come out and just drop filler in to the holes without either compressing it down or using sealant around the edges to hold the patch in place – Such repairs generally only lasted a few months and we saw evidence of repairs from less than eight weeks previously that were already cracking apart, making the potholes worse than they were before. 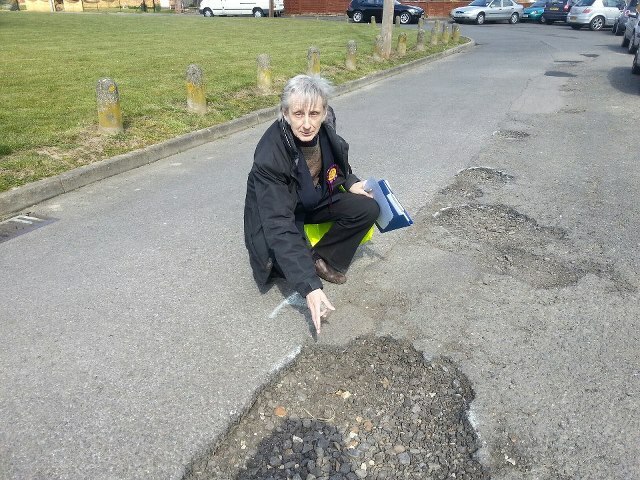 Interestingly, we all found that it was not just the state of the road itself that was causing concern but several residents spoke of issues with the paving, especially near the care home. We were also advised of disabled parking bays being removed and not replaced, with one resident complaining that he could not use his bay as someone else was always parking in it due to lack of amenity. It also became apparent from the residents survey that Geoff was carrying out alongside the petition that many did not know either who their local councillors are or how to contact them with their issues. Geoff used to be a councillor in Brunel Ward and was still recognised by a number of the residents as we went around, some of whom said that they had not had face to face councillor contact since his departure from the position. Above – Geoff Courtenay in Maygoods Green showing how bad the potholes have become – These have been marked with white chalk for months without attention according to residents. The branch will be carrying on with the petition for another week or two before presenting it to the council – Whilst there are enough signatures to get attention now, the more that are on the forms, the more weight the petition will carry and the better chance of the council listening to the wishes of the residents. If you live in Worcester Road, Maygoods Lane or Maygoods Green and we have missed you ,please get in touch either via the website or by email ukiphillingdon@tiscali.co.uk if you would like to sign the petition.